When it comes to dessert, my top things on my food wishlist are something that’s tasty, healthy and easy. 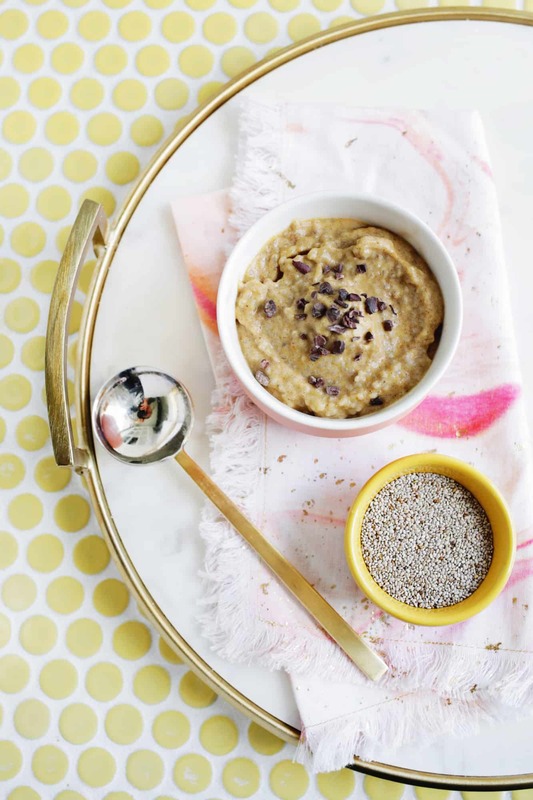 If you’ve never made chia seed pudding before, then you’re in for a treat, as it is all those things and you can switch up the flavors pretty easily by different mix-in options and toppings. 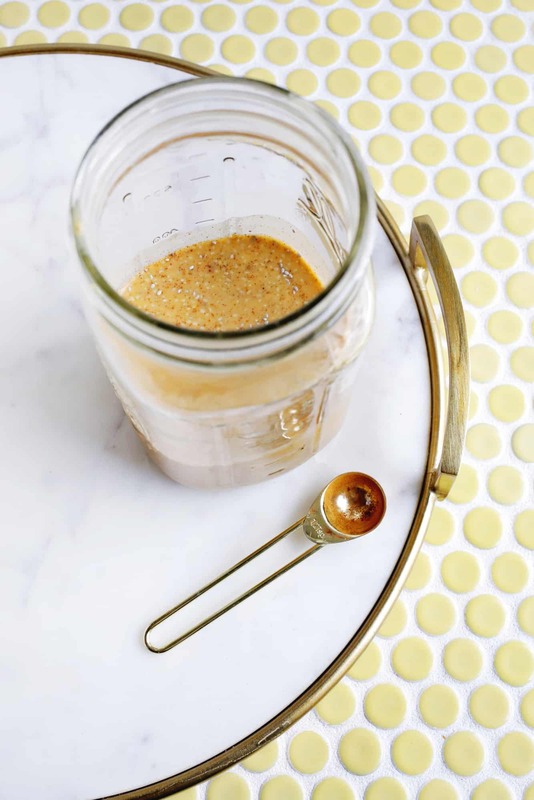 When you add chia seeds to liquid, they will soak up the liquid and expand adding a gelatinous texture that’s great for making puddings and jams. 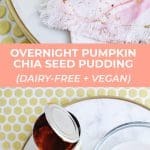 Since this time of year leads to all things pumpkin, I thought I’d try a pumpkin chia seed pudding with white chia seeds (you can use black too if you want to, the white just look prettier) and it turned out pretty delicious, so we’ve been making it weekly ever since. 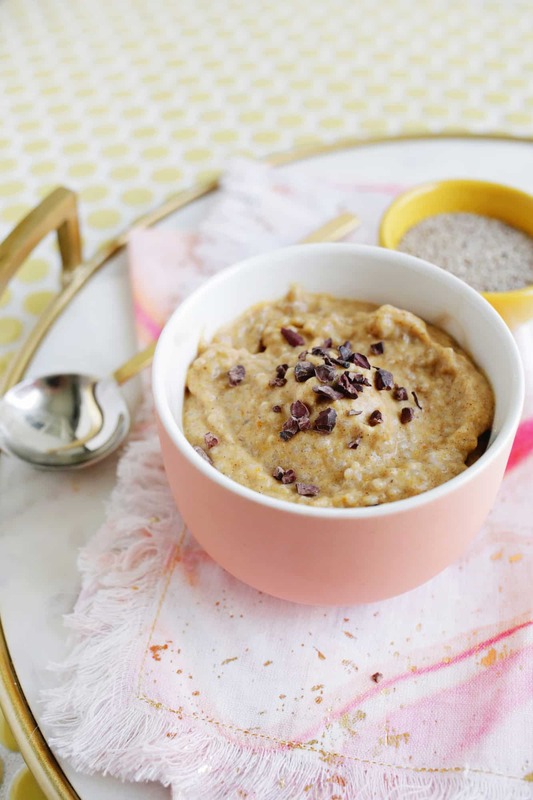 Add your coconut milk to your bowl. If your can of coconut has separated into two parts when you open it (a solid part and a watery part), then just throw it in the blender for a minute to blend them both together into a creamy milk before measuring out and adding. Add your spices, maple syrup, vanilla, and whisk to combine. Add your pumpkin puree and whisk to combine again. 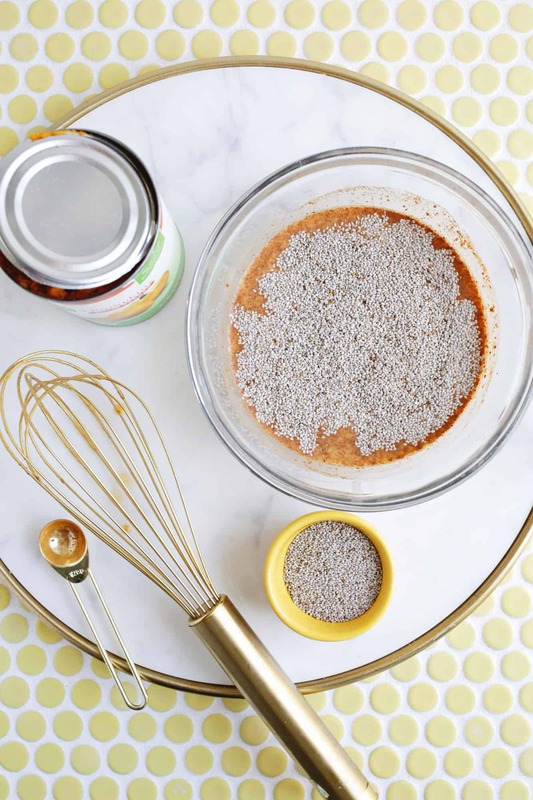 Add your chia seeds and stir to combine quickly (if you let them sit there for a few minutes before stirring they will have congealed together into a big blob). Once all your ingredients are together, give it a quick taste to see if you want to add more syrup for sweetness. Once your ingredients are together, pour the mixture into a glass jar or container and place in the fridge overnight to set. 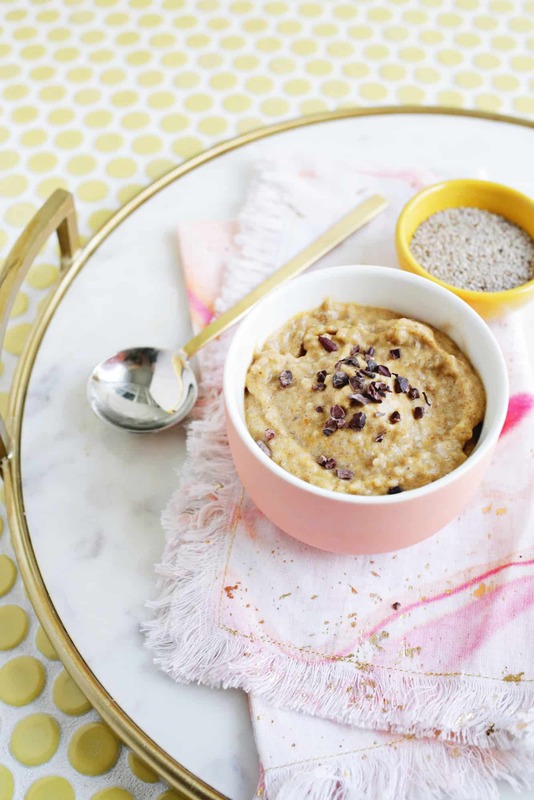 You could also make this in the morning and it would be ready for your after dinner dessert too. 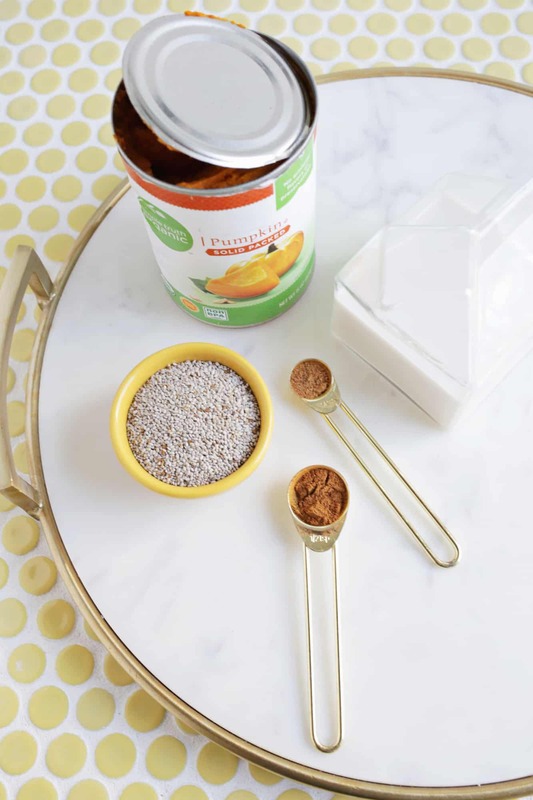 Add your chia seeds and stir to combine quickly (if you let them sit there for a few minutes before stirring, they will have congealed together into a big blob). Once all your ingredients are together, give it a quick taste to see if you want to add more syrup for sweetness. 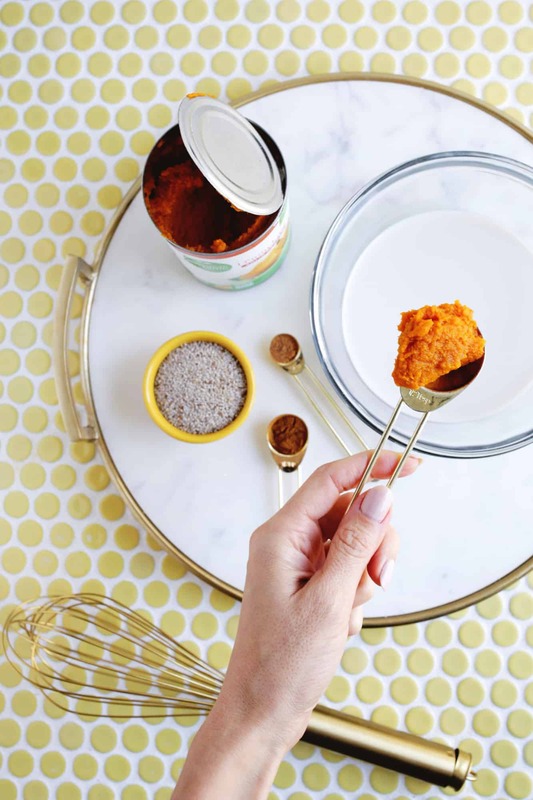 Once your ingredients are together, pour the mixture into a glass jar or container and place in the fridge overnight to set. You could also make this in the morning and it would be ready for your after dinner dessert too. Khombu Kids Boys Closed Toe Sport Sandal Shoes ~ Various Sizes/ Condition ! ! An Amazing Grove Collaborative Deal!